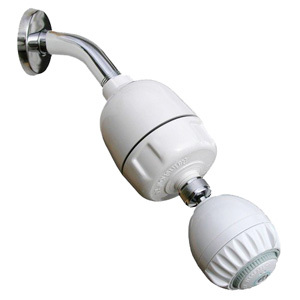 CQ-1000 Dechlorinating shower filter with crystalline quartz replaceable cartridge with a shower head. Removes harmful chlorine in the shower. Our proprietary KDF formula provides a better performance per ounce of KDF than other shower filters. Also uses Crystalline Quartz crystals to improve water quality, oxidize water and make your showers unforgettable experience! Crystalline technology uses specially washed, sun-dried quartz crystals to reduce the surface tension of the water, making it feel lighter and more energized. NEW!!! American made solid brass collar molded into the filter body inlet making the filter body so strong that even a pro athlete can't break it! Now you should be able to safely use Teflon tape on shower arm threads for a tighter water seal. 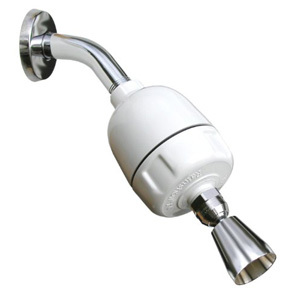 Rainshow r Shower filter is proudly manufactured in USA!